Our second anniversary was this past Tuesday, and it called for a special dinner out. We were originally thinking of heading to Seattle, but decided to stay in Tacoma since it was a work night. You don’t need to go to Seattle for great food, right?! Duh, that’s why you’re reading this right now! We decided on Asado Cucina Argentina since we never end up making it there. Why? I’m not exactly sure. It’s a little pricey for an every day dinner, and for some reason I never think of it for a special occasion. I’m glad I remembered it this time because we had an excellent meal. 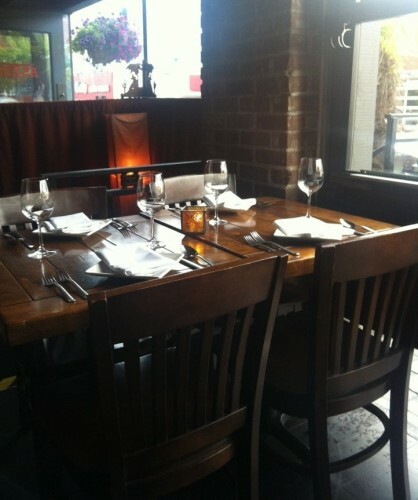 First off, Asado happens to have half off bottles of wine on Tuesdays. Score. Didn’t plan that, but it worked out nicely. You can try a bottle you might not normally order because of its price, or you can just get a killer deal. Either way it’s a win. I like the look and feel of the restaurant. When you walk in, you can smell the mesquite wood they use in their grill. The whole front of the restaurant opens up garage door-style to an outdoor bar, and it’s an awesome place to sit on a sunny day. The only thing I don’t love about Asado is that it gets a little loud in there, so having a conversation can be tough. You end up yelling, so that’s not great. Go to Asado for what they do best: their grilled seafood and meats. It’s unlike any other restaurant in Tacoma in its flavor profiles. Big, bold flavors of chimichurri, salsas, herbs and spices are integrated seamlessly into steak and seafood dishes that are cooked to perfection. Come See me at the Taste of Tacoma! This weekend, June 28-30, is the Taste of Tacoma, the largest annual food festival in the South Sound. 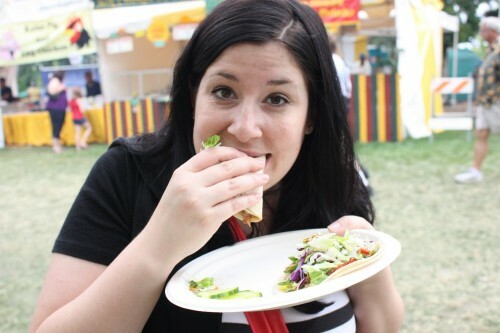 I wrote about the changes the festival has made this year, including healthier and lower priced options, the integration of food trucks, and The Taste Cooks!, a cooking stage featuring Tacoma chefs and food experts, hosted by Amanda Westbrooke of TV Tacoma. I’ll be one of those folks on the cooking stage on Saturday, June 29 from 3-3:45. I’d love for you to come see me! I’ll be talking about Tacoma Foodie, my cooking blog, A Big Mouthful, what it’s like to be a food writer, as well as how to shop the farmers market, and then doing a cooking demo with local ingredients from the farmers market. On the menu is a smoked salmon, asparagus and goat cheese pasta and a shaved zucchini salad. Check out the full schedule of chef cooking demos, as well as the Chef Cook-Off! following my demo at 4 on Saturday. The contestants, Chef Hudson Slater of Maxwell’s, and Aura Mae, known as “The Kitchen Beautician”, will be cooking from mystery ingredients in a battle similar to Chopped or Iron Chef. Other demos include Tom Pantley of Toscanos, Gil Turturici of Boathouse 19, Kris Blondin of STINK, Geoffrey Yahn of Dirty Oscar’s Annex and more. It should be a good time. I worked hand-in-hand with the organizers of the Taste of Tacoma this year to try to get the festival to be a little more Tacoma, a little more local. The changes they’ve made seem to be in the right direction. It’s not perfect yet by any means, but it’s good to see Tacoma restaurants be involved in the Taste Cooks! portion, as well as the healthier and lower priced items available from the vendors. If you haven’t been to the Taste of Tacoma in the last few years, it’s worth a revisit. For more about the changes to the festival this year, read my article on NorthwestMilitary.com. Since Coldstone Creamery closed, I’ve had my eye on the now-vacant space next to Round Table Pizza in Westgate for a while. I’ve hoped it would turn into a little neighborhood deli or cafe…or something…anything, except perhaps a frozen yogurt shop. 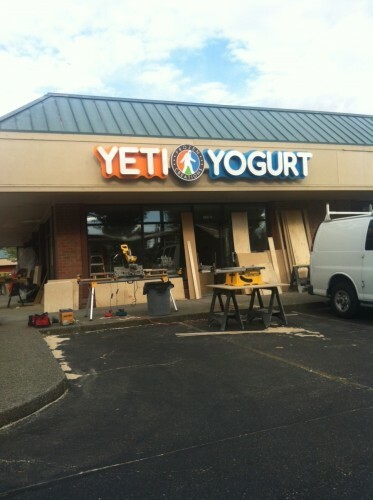 Lo and behold today I see signs go up for Yeti Yogurt, a Pacific Northwest chain with four current locations and six more locations slated to open in the coming months. I don’t hate frozen yogurt. In fact, I like it very much. Your choice of flavor and toppings, with less calories than ice cream…all good things. But there is a Gibson’s Frozen Yogurt kitty corner to this location. Aren’t two frozen yogurt shops in one block a little much? Not to mention, the countless frozen yogurt shops popping up all over Tacoma and the South Puget Sound and the soon-to-be Gibson’s Frozen Yogurt Truck coming next month (see my article in the Weekly Volcano on that here). Too much of a good thing? Maybe. 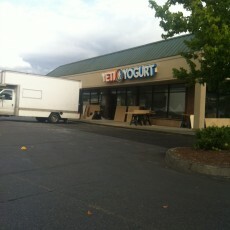 Either way, Yeti Yogurt in Westgate is slated to open this summer, as is another location in Fircrest. There’s a location at 176th and Meridian in Puyallup that’s already open. The Red Hot is one of my very favorite places in Tacoma. The food is consistently good, the beers local and cold, and the atmosphere easy and comfortable. I’m normally a creature of habit when ordering at The Red Hot, but this time I was told there’s two new sausages on the menu, and I had to give them a try. 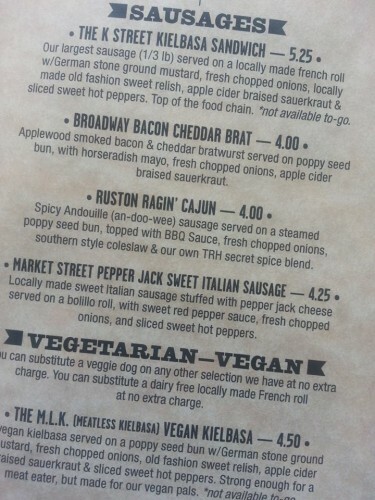 Sure, they have their Test Kitchen Thursdays each week, with new and creative combinations, but the two new sausages are on the menu for a couple months. They’ll be rotated out eventually, so get ’em while you can. This past weekend, I went on a solo road trip to Moses Lake, WA to visit one of my best friends, Koree, and to meet her new baby boy. I can’t think of a better reason to go over the pass to the east side of the state. Bonus: I ate at some really fantastic places, much to my surprise. Okay, I know – it’s pretty bad that I had the impression that Eastern Washington is a gastronomic wasteland. Sure, there aren’t many fancy restaurants or big-name chefs, but if you know where to look, the eating’s not at all bad on your journey over I-90. A trip east of the mountains isn’t complete without stopping at a fruit stand. It might sound a little cliche, but there’s a reason everyone does it – the local produce is fresh, vibrant and priced really reasonably. I stopped in Thorp at the Red Sky Orchards stand. I actually meant to stop at the larger, more touristy Thorp Fruit and Antique Mall, but I was actually glad I stopped an exit or two short at this smaller spot. 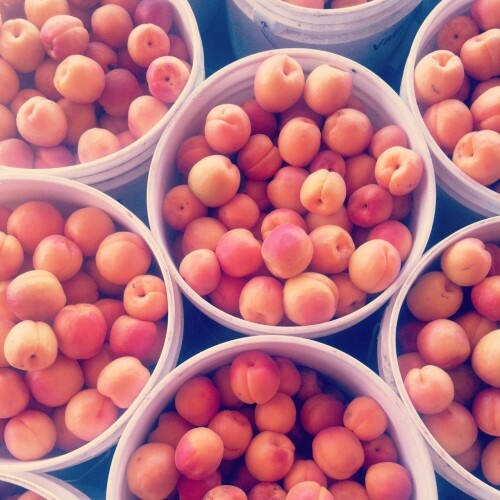 With gorgeous Yakima apricots, sweet cherries and wine tasting, it was a great place to stretch my legs and pick up some snacks. I also got a bottle of apricot wine that sounded pretty great. I stopped for breakfast in Ellensburg at the Yellow Church Cafe, at the recommendation of a Twitter friend, Rob. Twitter is my favorite way to get good restaurant advice in areas I’m not familiar with. What I found was a comfortable interior in the converted church built in 1923, and a menu of homemade items that was hard to choose from. I went with the eggs Benedict with curry hollandaise. It was phenomenal, with perfectly poached eggs and fluffy potatoes. The best kind of road food.